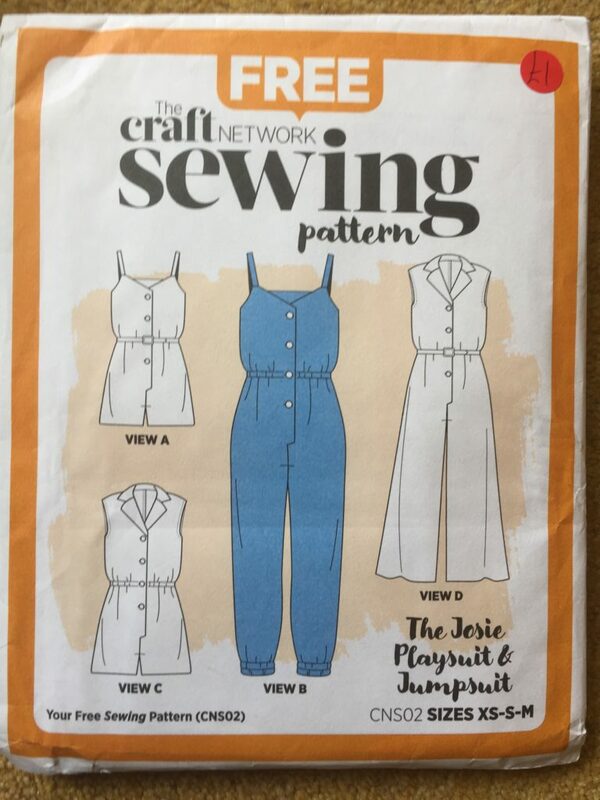 Ever since I found out the BBC hadn’t re-commissioned the Great British Sewing Bee this year, I have been very pissed off. The Bee has been a highlight of the year for me ever since it started. Back during the very first season, it encouraged me to get my sewing machine out again and have a go at sewing. 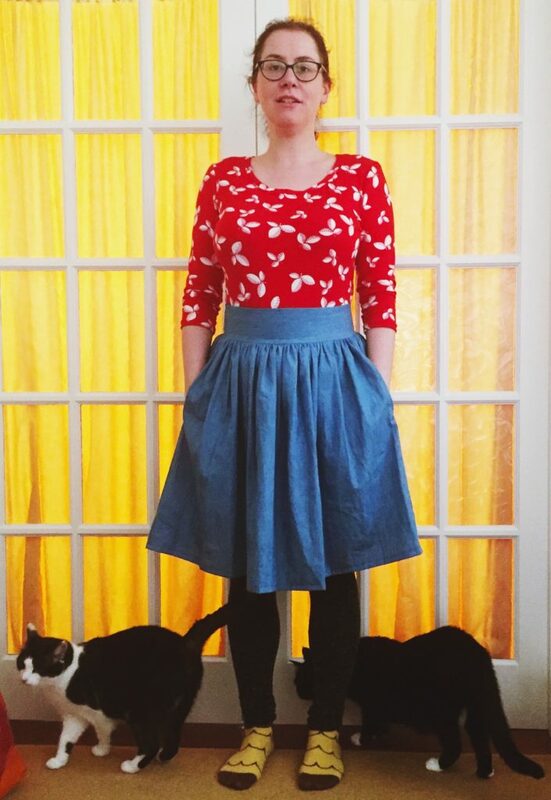 I remember that summer I sewed two skirts, one of which still gets used every now and then! So, when I heard they would do a Bee event instead, it seemed like some consolation. After some humming and ha-ing about whether I should go because of the cost of travelling to London, and the amount I have going on in my personal life, I got pushed over the edge as Melissa from Fehr Trade kindly gave me tickets to go. So that made me make up my mind, however then I couldn’t go on the day I had the tickets for and needed to get tickets for Saturday… anyway, I made it there in the end. 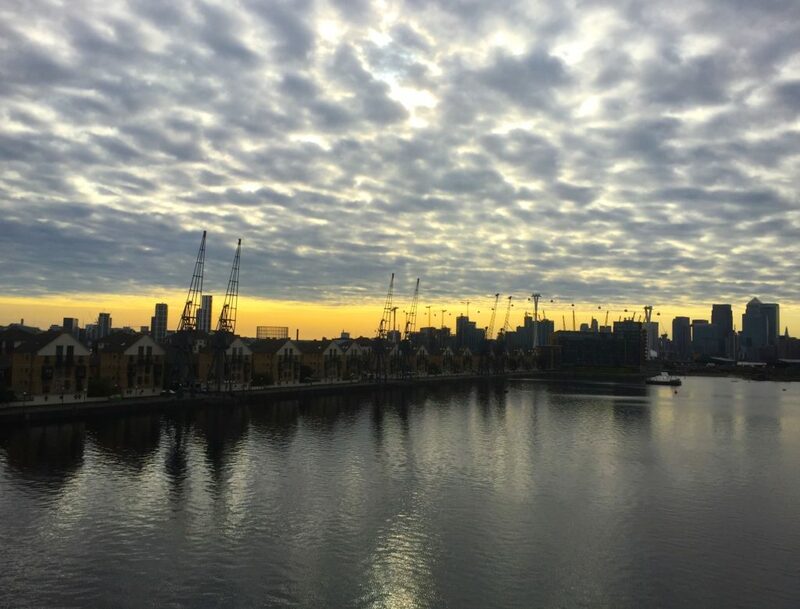 The Liberty exhibition area was fantastic – and I now have a plan to visit the Fashion and Textile Museum in London (I didn’t know such a thing existed). 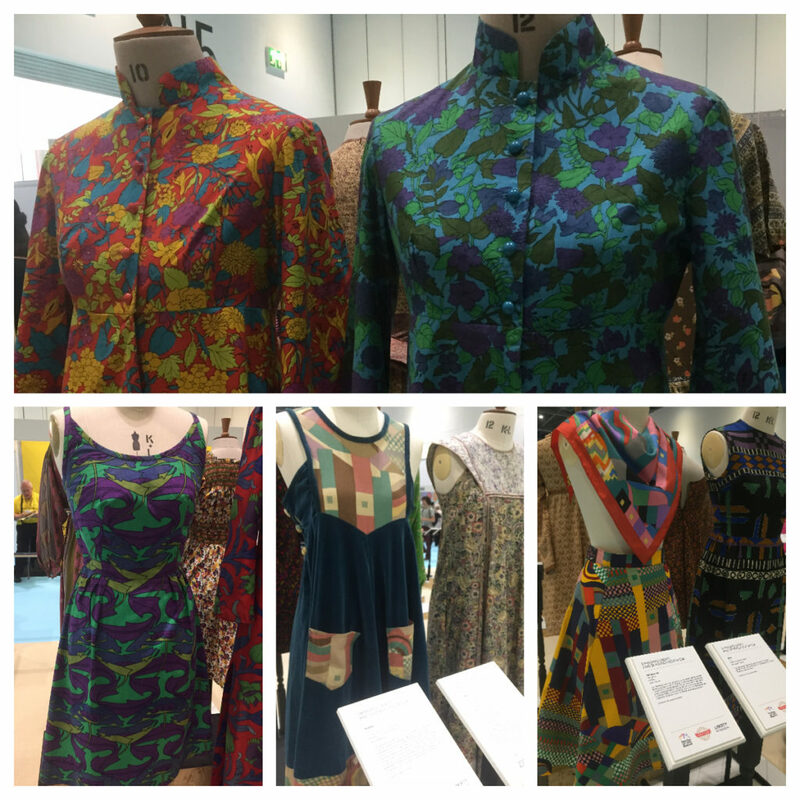 The green and purple art nouveaux patterned dress from the 1960s is my favourite! 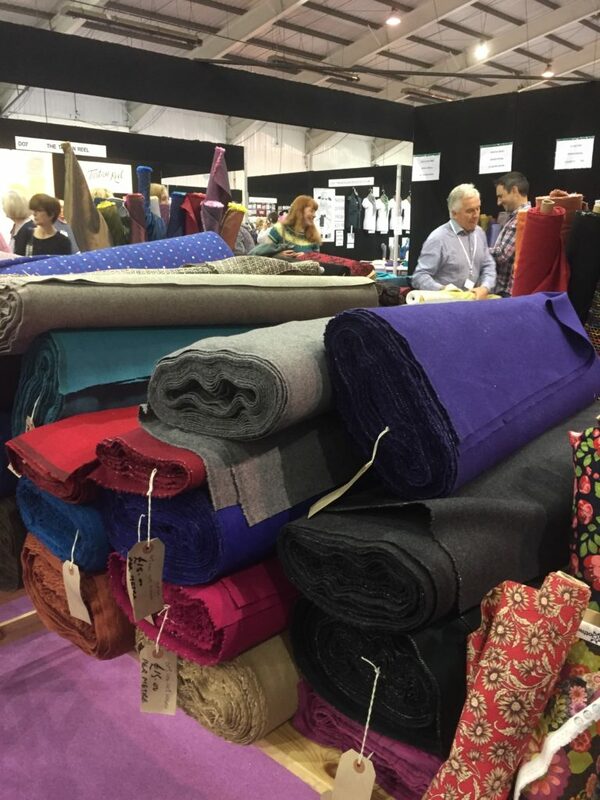 I particularly loved the fabrics on the Fabworks stand, and I got two ginghams from them that I am quite excited about. Their staff were lovely too, they even gave me a little sewing kit which was sweet. Other special buys included a Mavern Kitty dress pattern, which has the most lovely packaging I’ve seen on a pattern, and some denim chambray to make it with. Although it was a great day, and it was lovely to go with my friend from work, Leila, I was a wee bit disappointed by the event. It seemed smaller than I had expected, and the stands that were there, were either totally overloaded or quite spartan. I was glad I had bought the tickets when they were half price because I’d have felt a bit sore if I’d paid full price. Other gripes I had included no map of the exhibitors (these had to be bought) and no where to sit except for the very minimal seats around the champagne bar. I sound like a complete old lady, but I don’t care, I like to have a sit down! Would I go again? Probably? I think if it was bigger I’d be more committed to going. It needs to be worth it to travel so far and spend so much just to get there. 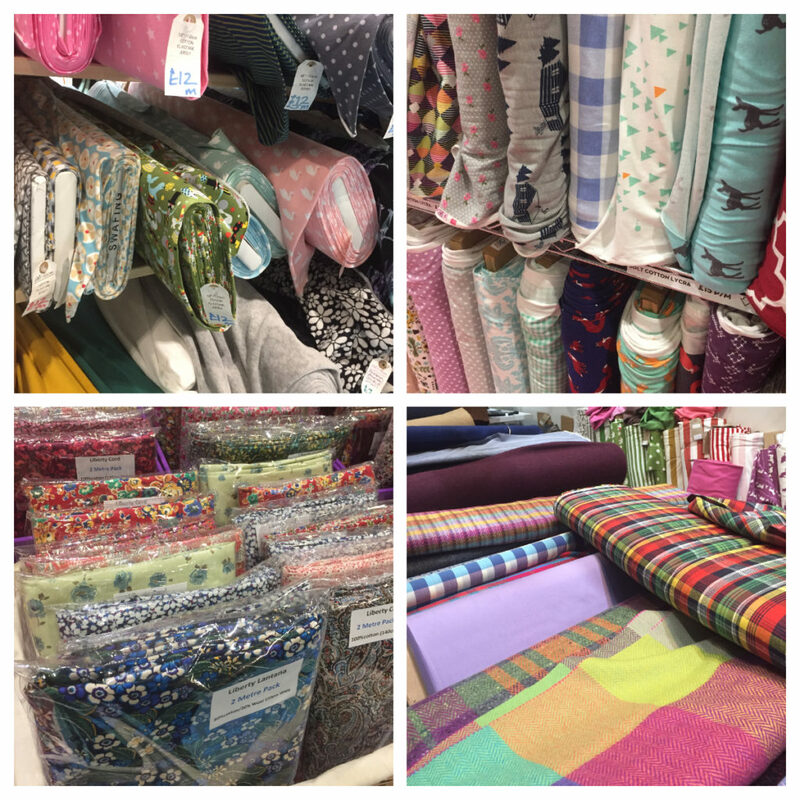 The Stitching, Sewing & Hobbycrafts show is held on, or around my birthday each year, and its a tradition for me to go with my Mum. We’ve been going for what must be 15 years now and I look forward to it so much. It is a craft event that has stacks of craft stalls selling lovely goodies at the Westpoint centre in Exeter. 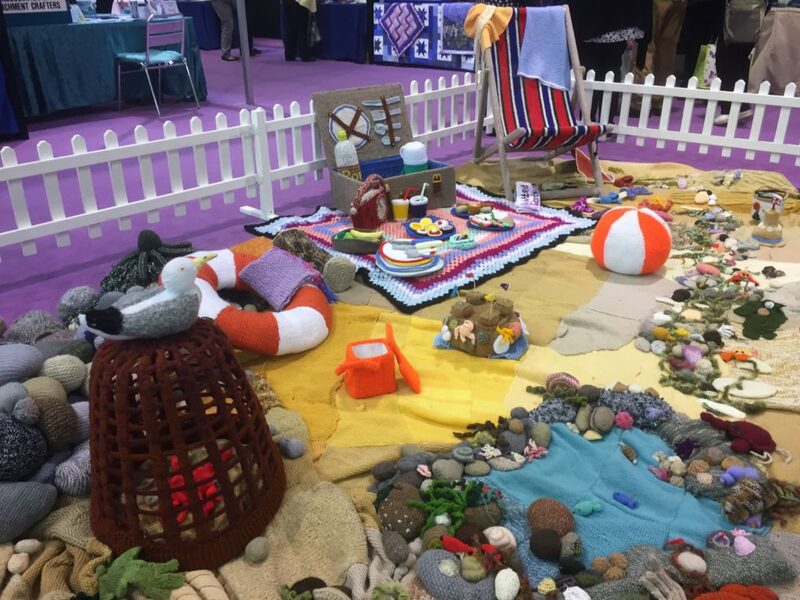 Every year they have a slightly different set of exhibitors – it seems to change as crafting trends come and go. 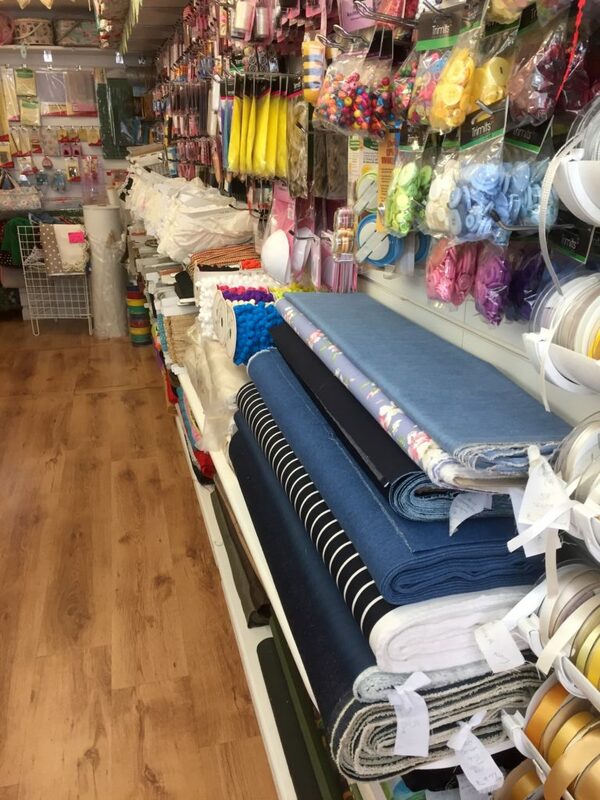 This year they changed their name from ‘Creative Stitches & Hobbycrafts’, to be ‘Stitching, Sewing & Hobbycrafts’ and I was happy to see some of the papercrafting stuff had been replaced with more sewing and fabric, yay! This stand (unknown name!) had some great jerseys, and I picked up one of their reduced remnants to make another Agnes top. 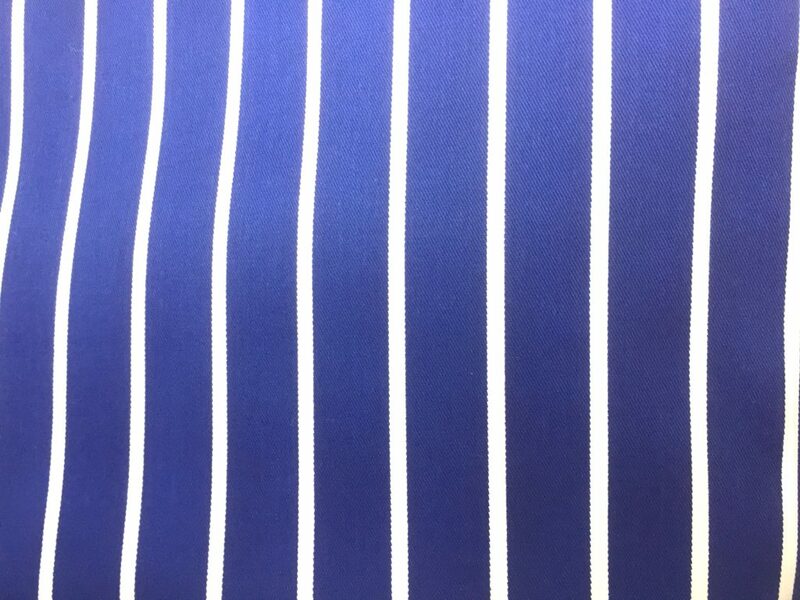 I love stripes but hate the idea of pattern matching them – this striped jersey is perfect because the stripes go in all directions! 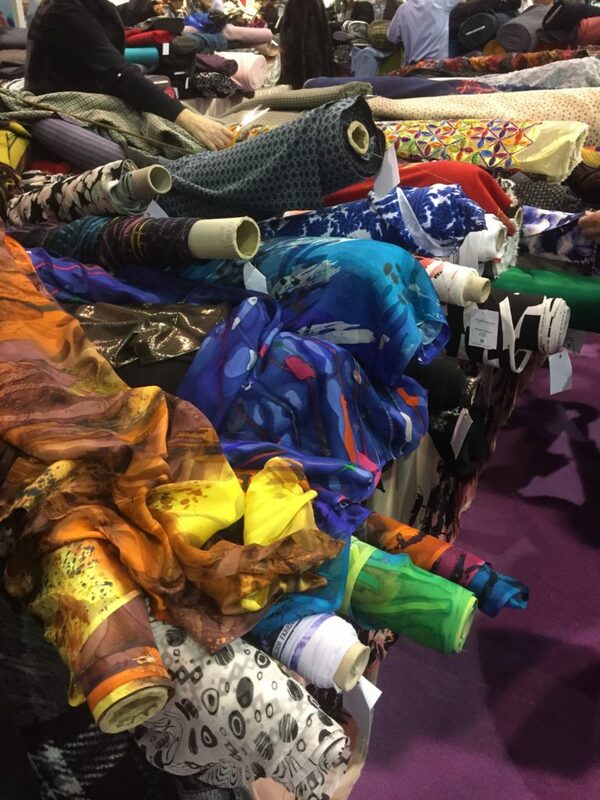 There was another fabric stand had the most wonderful selection of fabrics, I went back about three times and bought more from them. So many bargains to be had! I’ve picked up a lovely Ponte Roma geometric print in black, green and white, the softest jersey I have ever felt in a floral pattern, a soft and drapey black floral viscose and a floral fabric which I don’t know what it is, but its destined to be made into a Tilly and The Buttons ‘Bettine’ dress for my sister. 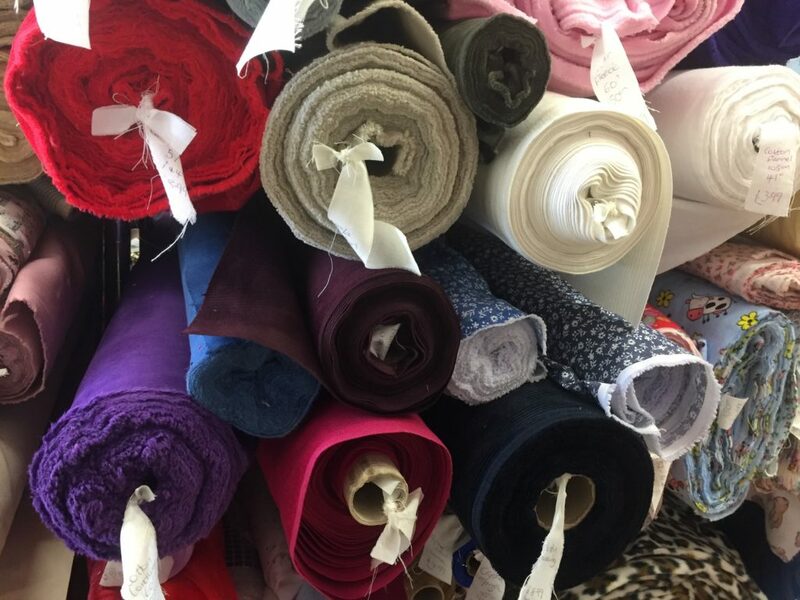 How much were these fine dressmaking fabrics? A mere £4.95 a meter! 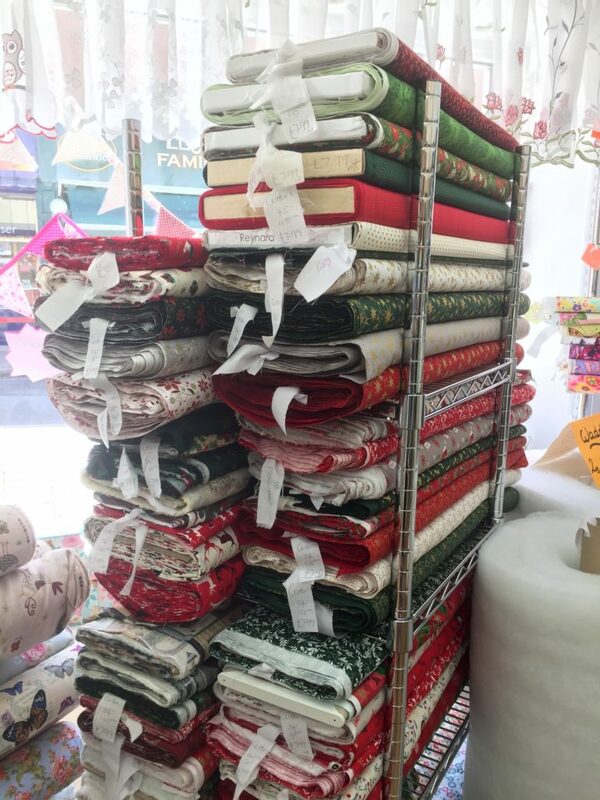 I think the stand I got these from was called Lili Fabrics, however, when I’ve looked at their website they don’t sell the same fabrics online. What a shame! 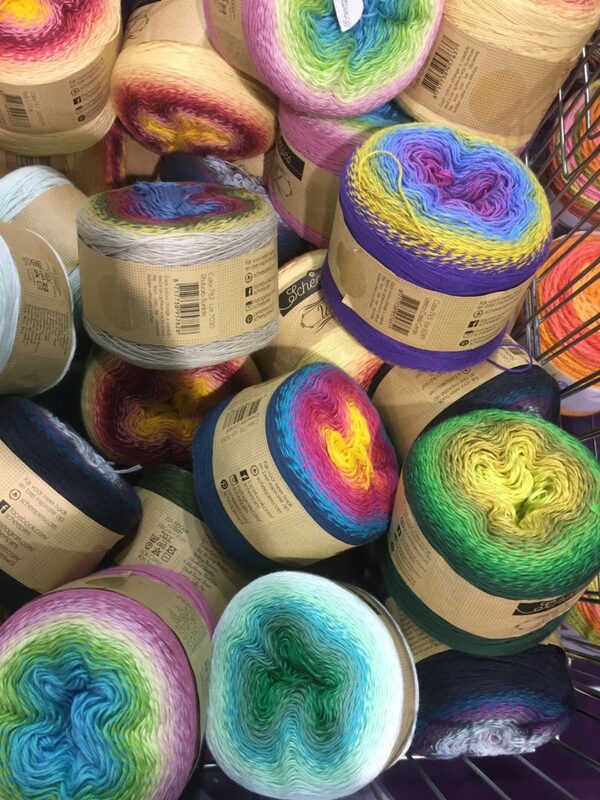 These balls of yarn at The Black Sheep stall almost had me reaching for my knitting needles! I’ve spent several days staying with my Mum in Devon which has been a real treat. I have been settling my two gorgeous cats in with her. They need to stay with her for a bit because me and my other half have moved into a rented house while we finish selling my flat and look to buy somewhere together. Sadly our landlords have a strict no cats policy. Although it was sad to move them down to Devon, I know they are in the very best place they could be and they already know and love her. My Mum lives in Tiverton, which is in mid Devon/East Devon, and isn’t far from where I grew up. I love going back to visit her and spending some quality time together. 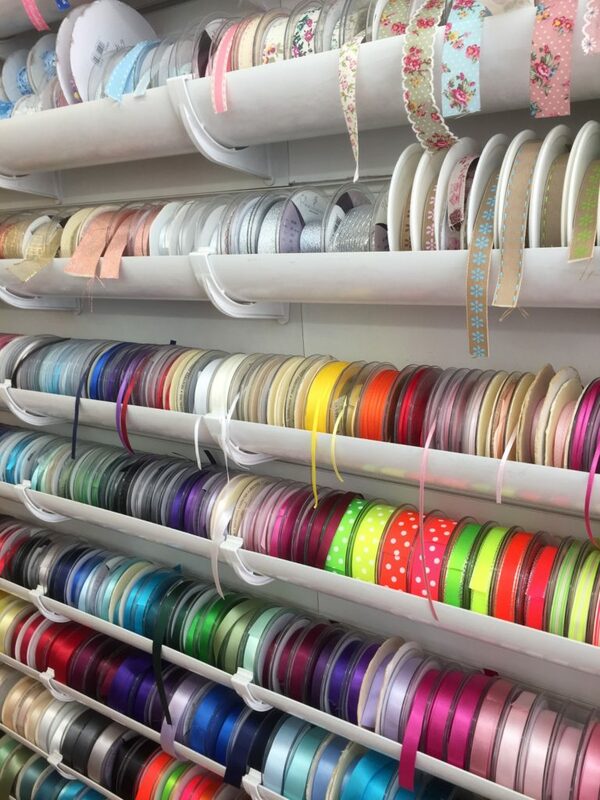 It also means I get to visit my favourite fabric shop too! 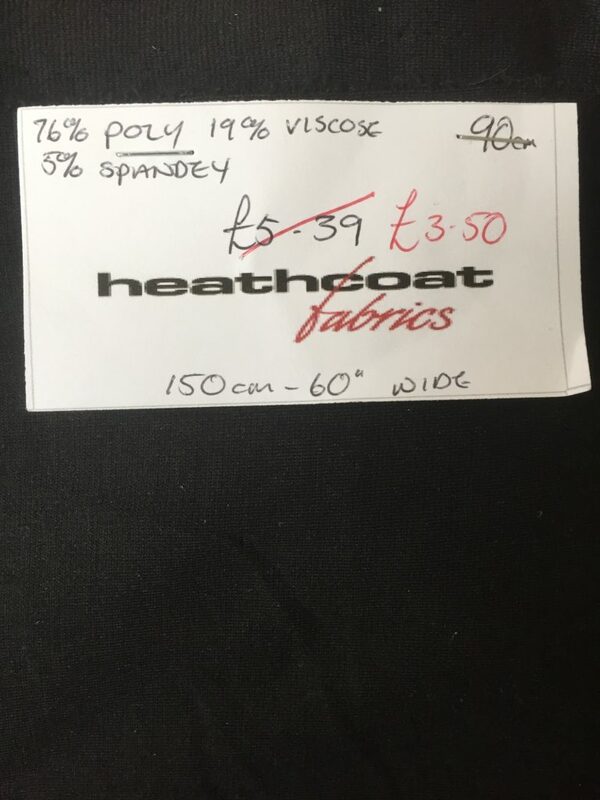 Heathcoat Fabrics is an absolute hidden gem. 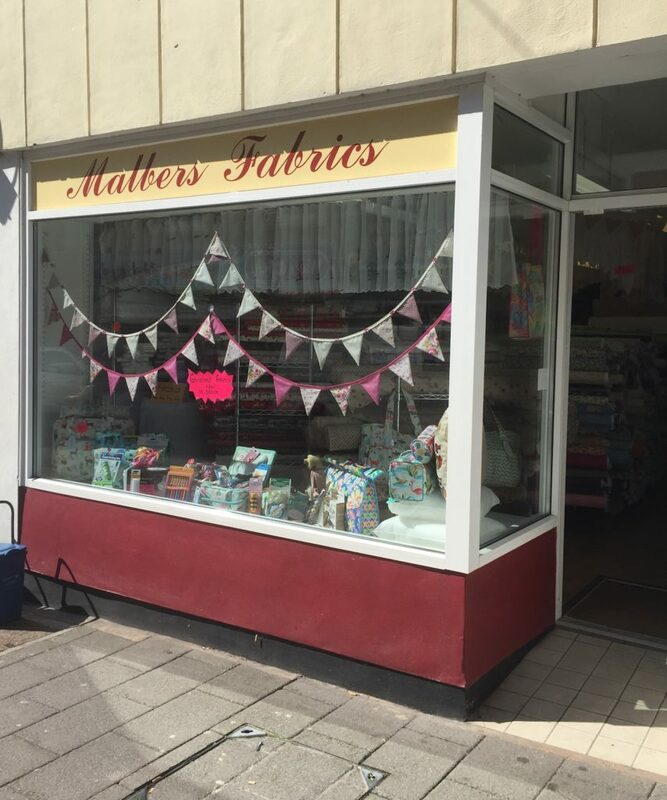 I also visited Malbers Fabrics which is in Tiverton town centre and they did not disappoint either! 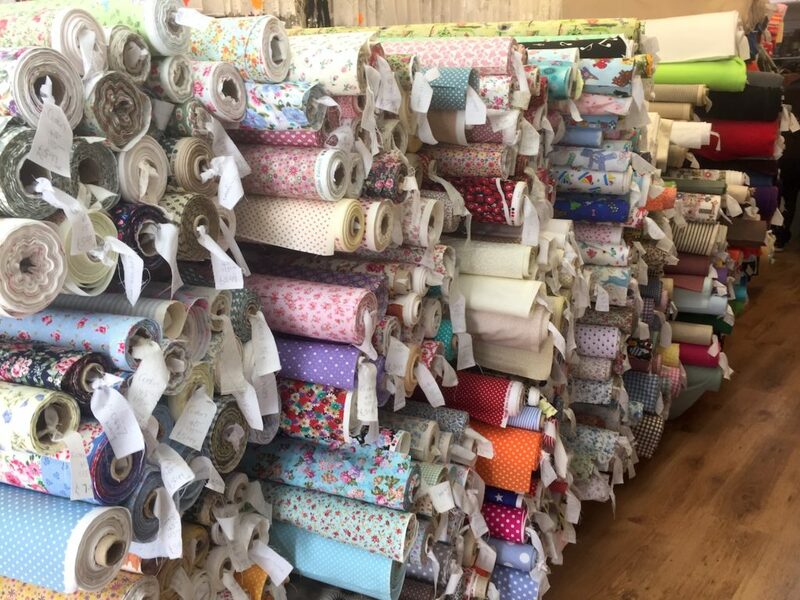 I’m on a real Tilly and the Buttons pattern kick at the moment and so I was hunting for suitable fabrics for her patterns. Here goes with what I bought. It was £9.99 per meter and I bought two meters. I’ve since cut out the Cleo pattern and found I have enough to make another one which was a happy accident. This cotton drill was a bargain at £4.99 per meter so I have snaffled it up to make another Cleo. The shade of blue is so bright and summery, I hope it will carry some summer feelings on into Autumn. So I’m not really sure what this fabric is: its a stretchy jersey that is quite thin and has a light crumpled texture. It has a drape to it which makes me think I will use it for some sort of dress. 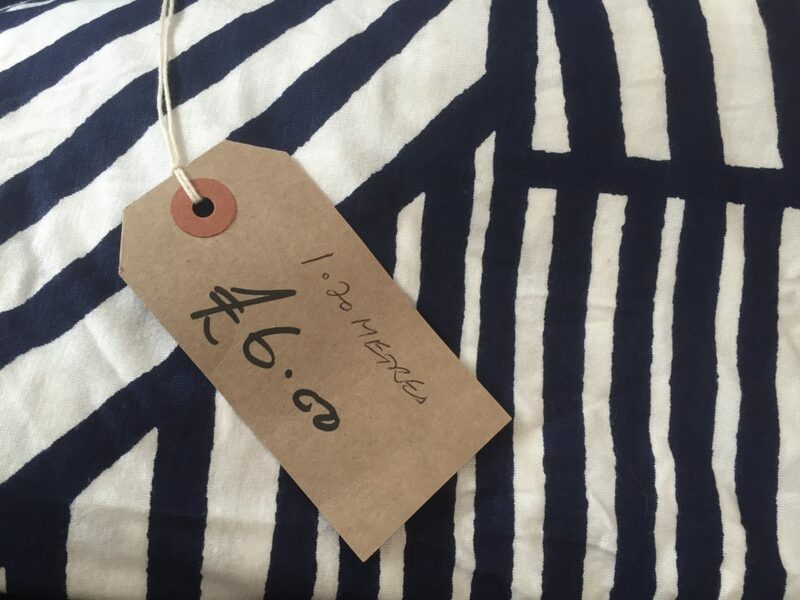 I have so many navy and white striped tops (at least 10P), I definitely know I like this sort of thing so at £7.99 a meter I thought ‘why not?!’. I’m going to start looking for a pattern for it once I check if I bought 1.5 or two meters. 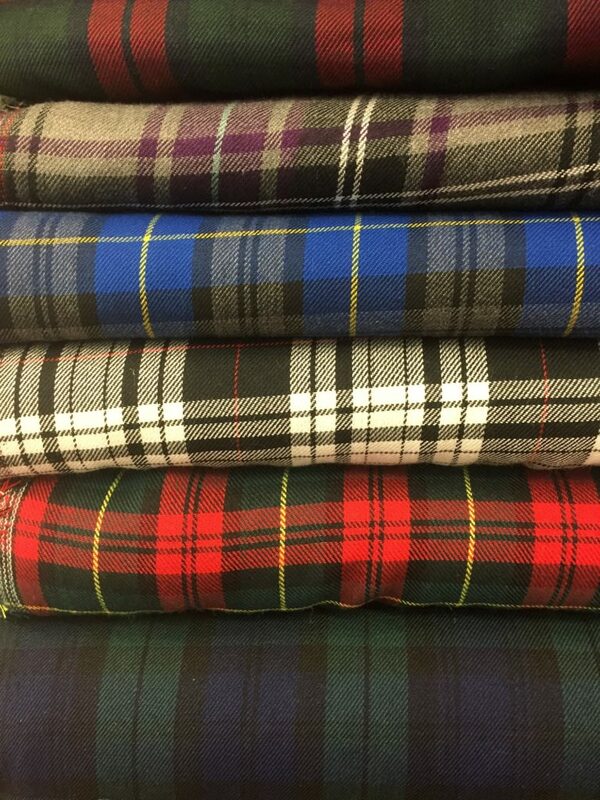 I’ve been looking for some needlecord to make an autumn skirt with. 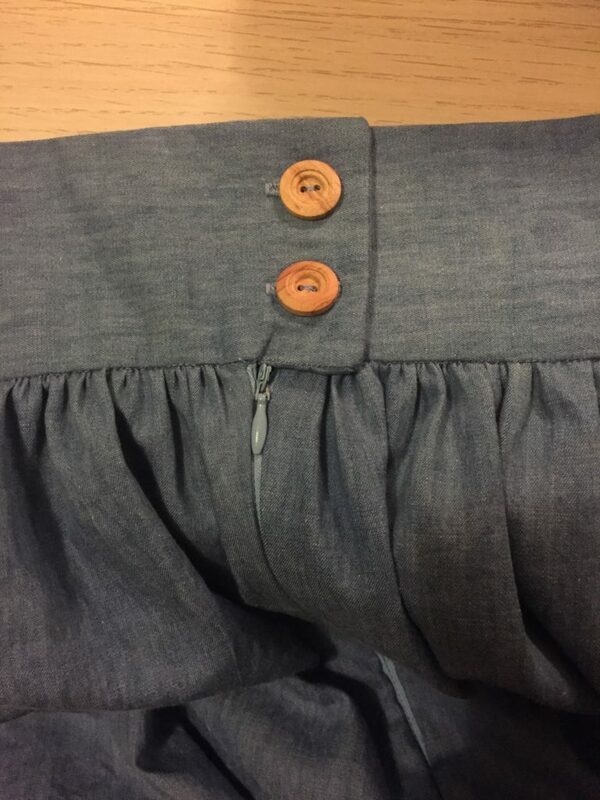 I have my heart set on making an A-Line, finishing above the knee with a button placket down the front. 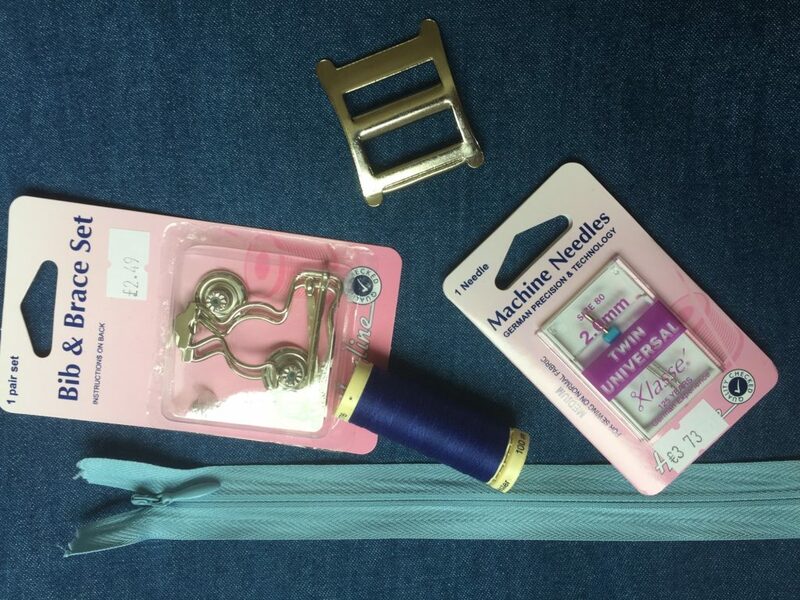 I’ve never done buttonholes and want to have a go and make something I know I will wear a lot. 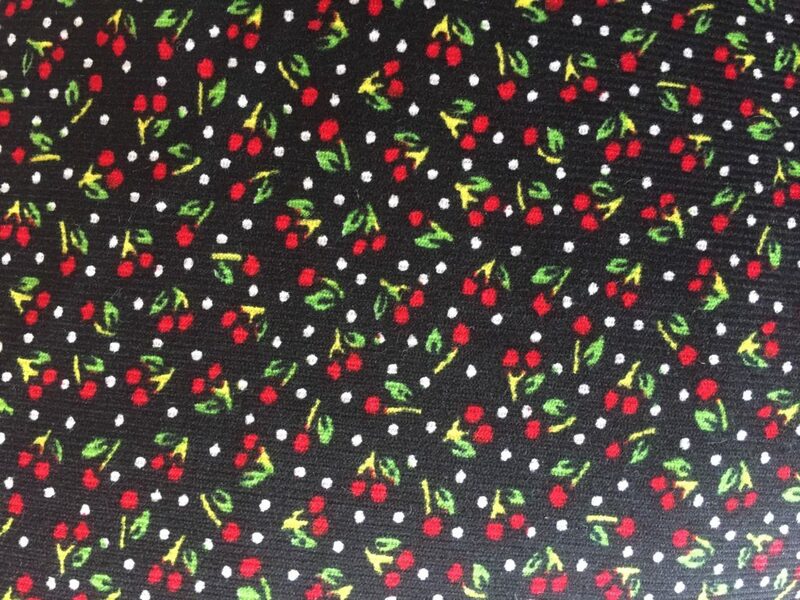 This sweet little pattern won me over, I especially like the polka dots that break up the cherry pattern and that it is so soft. I think this was about £8.99 per meter. And the random buy of the day is: black polyester! This is a bit of an odd one. I don’t know what sort of fabric this is, its a knit, but not a normal one, and its quite heavy. I’m sure this is something nobody else would want, but when I saw it, I saw the potential to make a skirt I have wanted for years: I want to make a skirt like Daria’s!! I adore Daria. I watch episodes in bed when I’m ill and it always cheers me up. 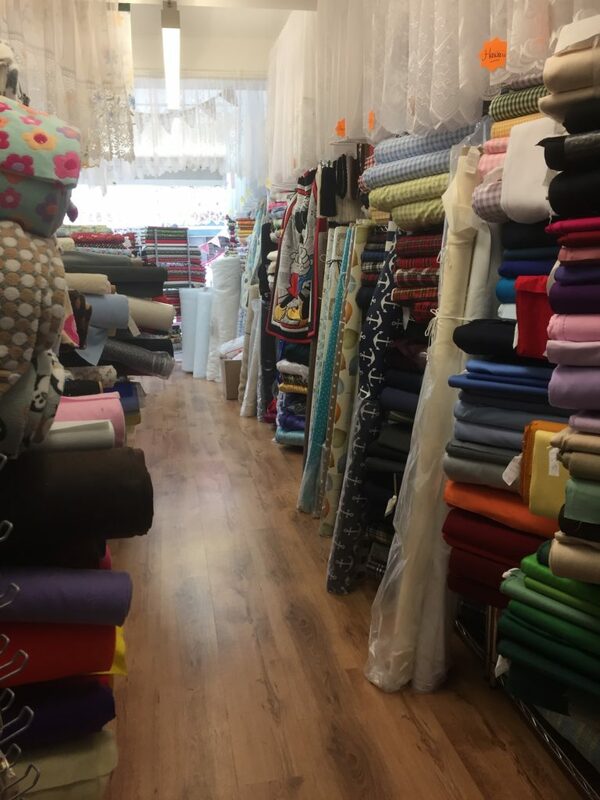 I wasn’t expecting to spend anything in here as I had thought it was a quilting fabric shop, but I was wrong! 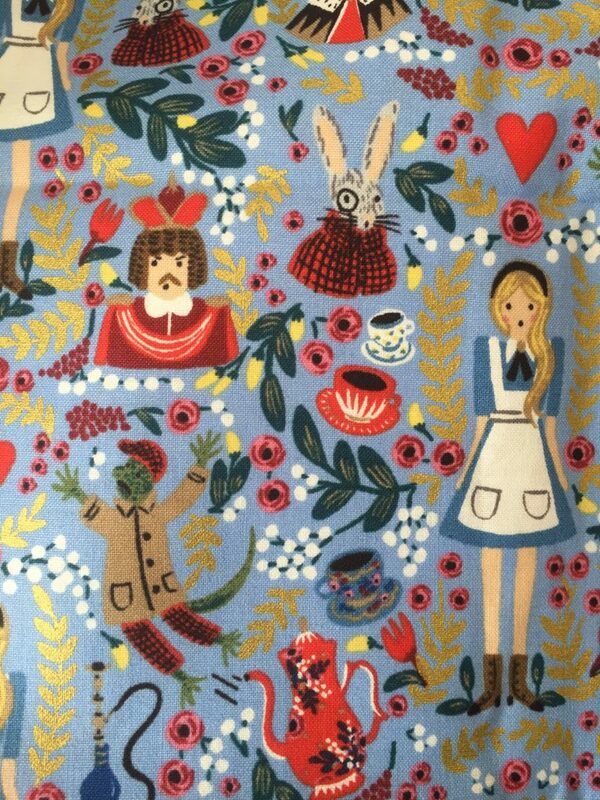 I talk through this in my review here: Malbers Fabrics. 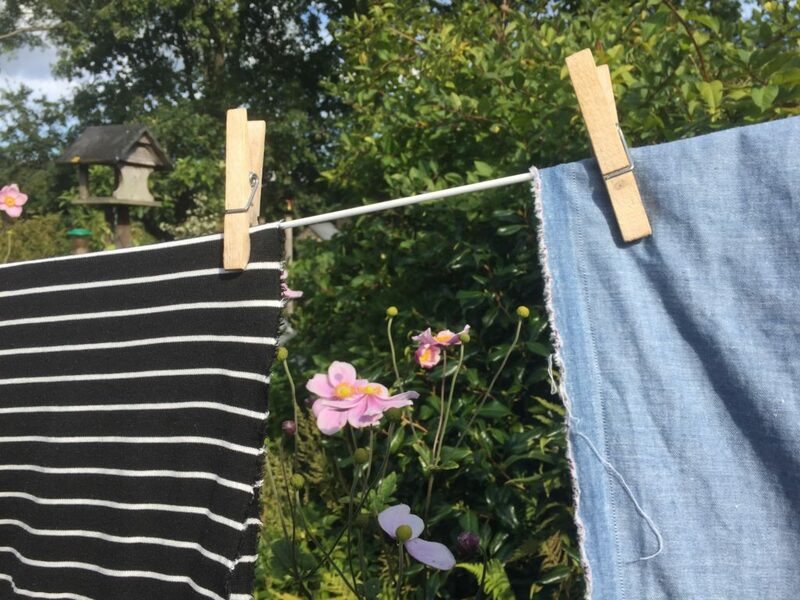 I might not be good at many things in life, but I am a hero when it comes to pre-washing fabrics! So, I was more restrained in Malbers after I had already spent quite a lot in Heathcoats. 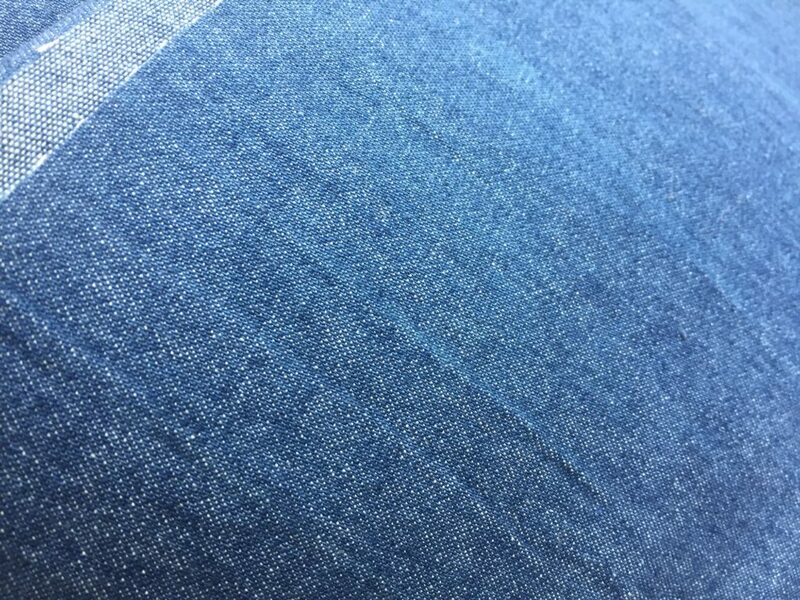 I bought 1.5 meters of lovely, beautifully soft chambray in pale denim which I love. I’ve been looking for some just like this but they all fell short in some way, so this one is great. It cost £8.99 per meter. 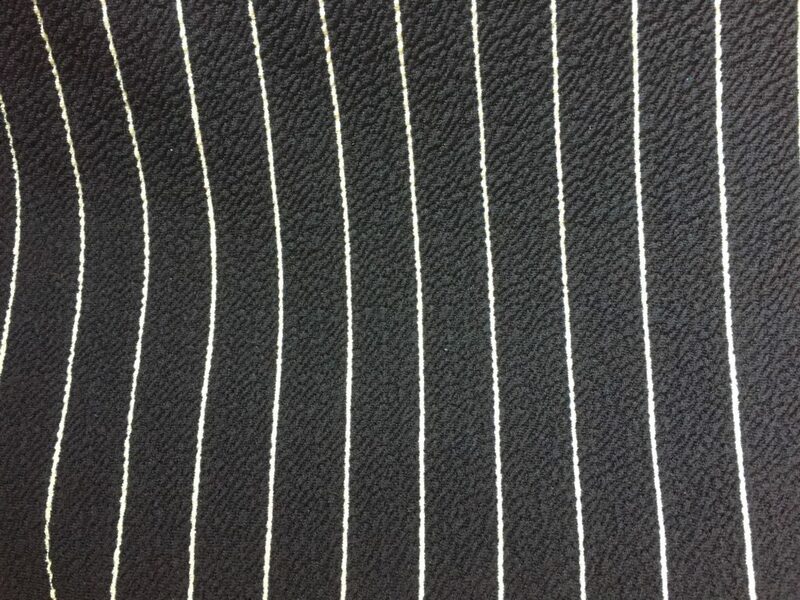 I also found some lovely quality striped Ponte Roma which will be perfect for a Tilly and The Buttons CoCo dress. 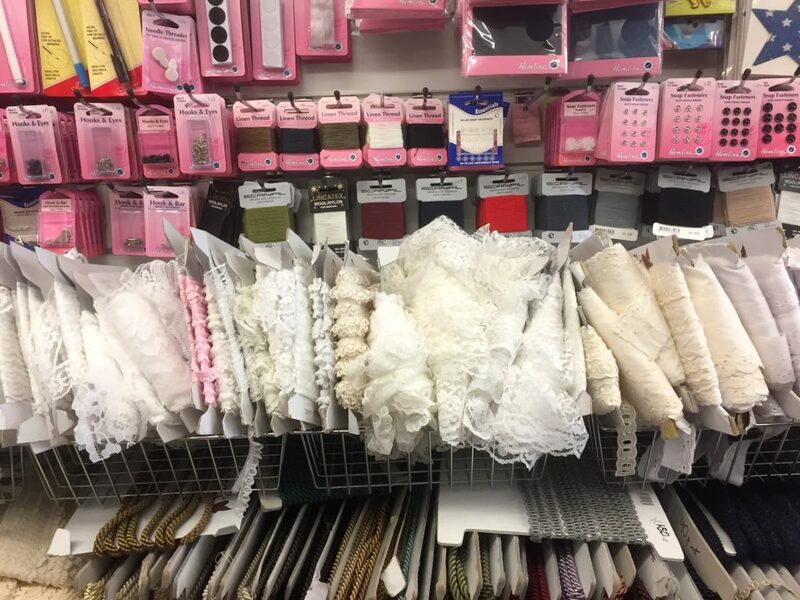 This was just £6.99 per meter. 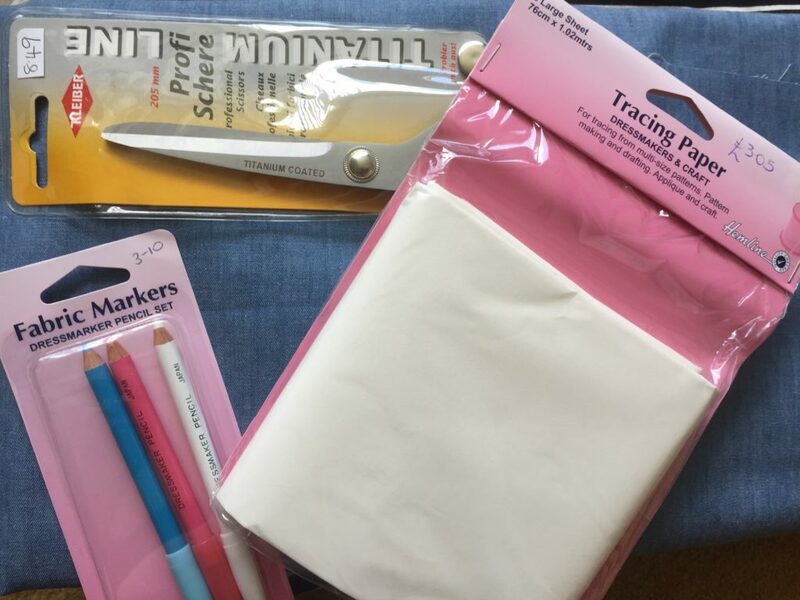 I picked up some more basic accessories in Malbers – most importantly the sewing scissors as I have ruined mine cutting paper with them. Very naughty. This is quite sweet, no? 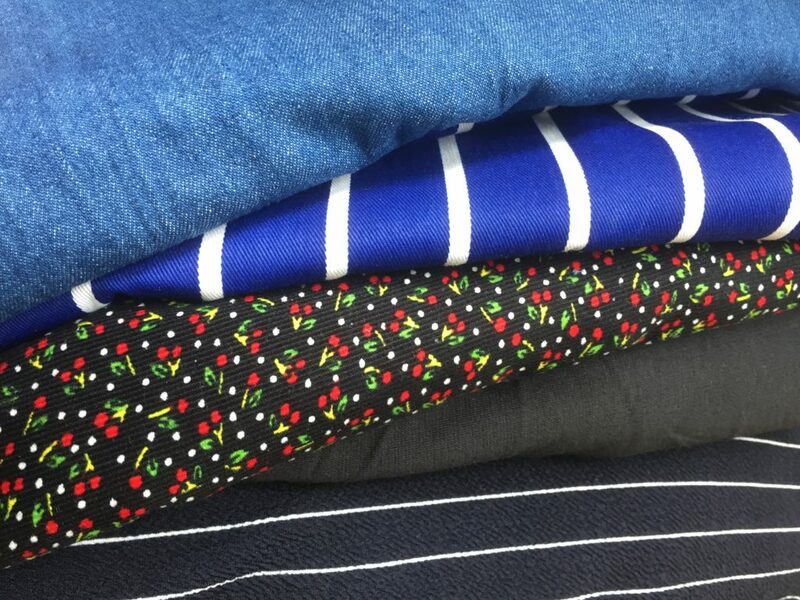 So yes, I realise I have spent quite a lot of money from this trip to Tiverton, but I am very happy with what I have picked up, and even more excited about what I can make with it.